Due to the deforestation across India, numerous elephants can be seen wandering in the villages and communities. Numerous animals across India have been forced to encroach on human habitats in search of food and shelter, and end up wandering through villages or across crop fields, desperately trying to find a new home. However, people often take extreme measures in order to prevent these animals from damaging their property. 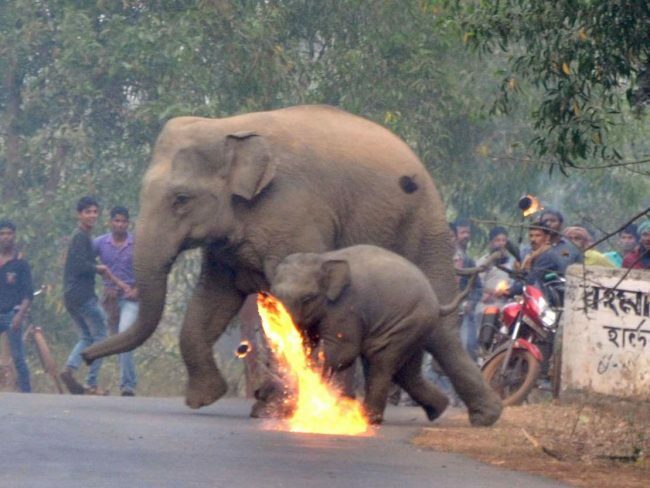 The following photo has caught the moment when angry Bishnupur residents launch firebombs at a mother elephant and her calf as a way to stop them from wandering onto their crops. The panicking animals run across the road, terrified. The following photo shows villagers who throw stones at a herd passing through their village. 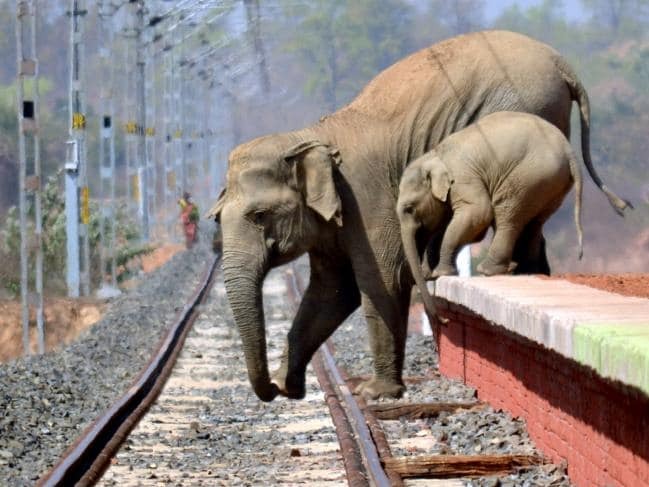 Young people are taking pictures of the wild elephants in order to record such incidents The following photo shows a mother elephant and her calf attempting to navigate the railway tracks constructed through their natural home. 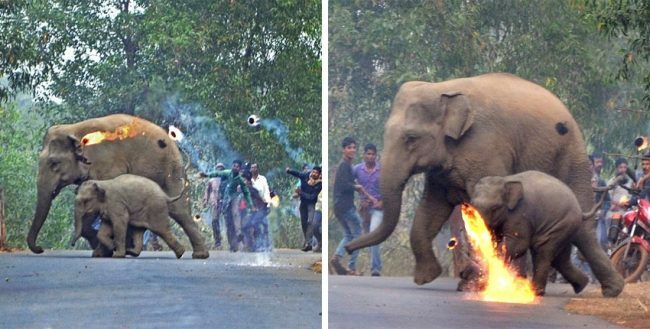 These heartbreaking images were taken by photographer Biplab Hazra, whose goal is to raise awareness about the state of elephants due to their endangered habitat. 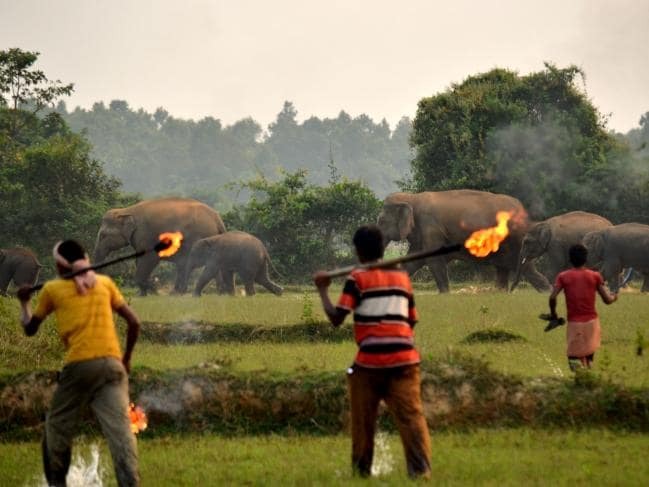 The last image shows angry elephants chase these people across farmland as they run through knee-deep water and high crops. Elephants need to spend up to 19 hours a day feeding, and produce about 220 pounds (100kg) of dung a day. While villagers do their best to chase them away, the dung is a key means of spreading germinating seeds, and they are vital in maintaining the integrity of forests and grasslands. 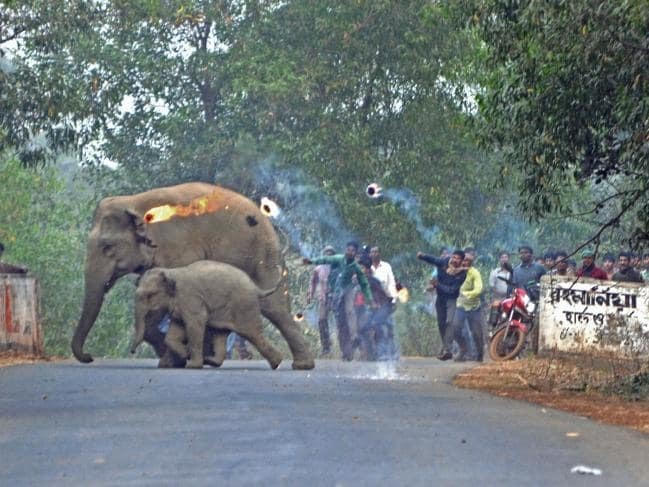 This is a serious issue that needs to be addressed properly and as soon as possible, as the number of Indian elephants has drastically decreased in the past several decades.